I was going into a gorgeous building at Ole Miss. It was on one of the prettiest campuses I’ve ever seen. Casey Coston told me that Kelsey Raymer and Kelly Litzelfelner and some sorority girls from Alpha Omicron Pi wanted to talk to me about drilling a water well in the Horn of Africa. So I walked into the sorority house. I expected to talk to a few members of the chapter. But to my surprise—all of them were there. It looked like there were a hundred people sitting on the floor. They listened intently. They asked questions. And then they gave enough to drill a well. They wanted to help girls who didn’t get to go to school because they were carrying water all day. And then Casey took me to meet William Kneip of the Phi Delta Theta fraternity. Once again the whole fraternity was there. I’ve never seen a group of guys more respectful and interested. They listened and asked incredibly insightful questions. And then they staged a fundraiser to drill a well. Next Casey and I went to see the president of Ole Miss—David Jones. He loved what we were doing and encouraged us to enlighten students and show them how they can make a difference in the world. He wanted students at Ole Miss to learn all of those important lessons of life that you might not learn in a classroom. We went to thank him for the opportunity, but he thanked us even more for being there. From there, we went to Alpha Omega that houses the campus ministry where Casey ministers. It didn’t take long to notice all the pictures of CRF children on the wall and around the coffee bar. And then there was a table to sponsor new children. These students love CRF. They go to our children’s work in Cap Hatien, Haiti every year to help. Next Casey had me speak at his church. More orphans were sponsored. Then Eric Dahl, one of Casey’s elders, hosts an annual bicycle ride to raise money and awareness. More children in Haiti and Uganda were sponsored. Since then Casey has preached at other churches where even more children were sponsored. 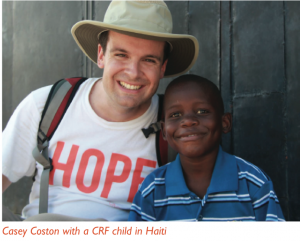 When I heard him speak at the Campus For Christ conference last year, he spoke about how CRF can help your campus ministry. Casey doesn’t work for CRF. But Casey works for CRF. I wish everyone could be like Casey. It’s like he talks about CRF everywhere he goes. 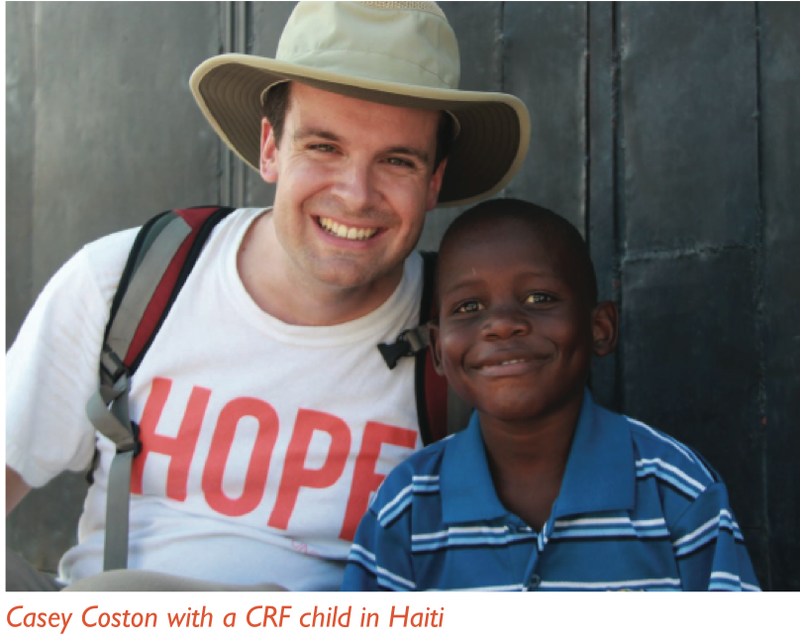 He brings CRF into environments where you might not first expect to receive a lot of help—but they do help. We have a lot of children presently who need sponsoring. I’m going to do everything I can to help. But I’m confident that we will get new children sponsored, old children sponsored again, and bring even more water to areas of drought. It’s because Casey is out there… And so many others like Casey. Be like Casey because Casey loves children like Jesus does.